Hello and welcome to a new mini series from Sidepodcast, The Great Debates. Formula One is surrounded by endless discussion, speculation, rumour and opinions, but there are some subjects that are more deep rooted than others, some that go right to the heart of what makes F1 the spectacle that it is today – for good, or for bad. This series, we aim to investigate some of those debates and whilst not definitively answering the questions, at least making sure they are asked. This first episode starts with a fundamental principal of Formula One, its very purpose of being. The question “Is F1 entertainment or sport?” at first seems obvious. It’s a sport. In fact, it’s a motorsport, the clue is in the title. The drivers have to be at peak physical fitness, they put in hours of training at the gym and in the simulator, and it all comes together when teams and individuals are pitted in head to head competition over a season of events. It couldn’t sound more like a sport if it tried. And yet, the closer you look at it, the more you start to see the elements that point towards entertainment rather than sporting endeavour. You’ll have heard the arguments, I’m sure, whenever something like DRS is debated. The artificial device used on cars to promote overtaking where it previously would not have been possible only exists because otherwise the racing would be considered boring. To appease fans, DRS was introduced, with welcoming arms on one side, and, of course, an outcry on the other. The concern rests on whether these race-altering aspects are diluting the purity of the sport, because they are done purely for entertainment and not for sporting reasons. Fans are giving up at least two hours of their Sundays, for an increasing number of weekends a year, and deserve to get something back in return, but at what cost? Whenever the Sporting Group or similar collections of high-powered people get together to discuss Formula One, its current state and its future, they inevitably turn to the subject of “improving the show”. Is it a show, then, first and foremost? Is it the entertainment provided by two hours of racing on a Sunday afternoon that should be prioritised over the purity of sport? And what is that purity anyway? Where does it come from? Where is the rule book that defines what is and isn’t acceptable, where the line is before sport becomes entertainment? Whenever the four yearly Olympic Games rolls around, there’s always a conversation to be had about why F1 is excluded. Is it because it’s not a sport in the purest sense? More likely, what makes it into the games is a somewhat arbitrary decision. Regulations regarding excluding sports that require mechanical assistance at the games were removed several years ago, but there doesn’t seem to be a rhyme or reason about what gets selected. So, perhaps best not to use the Olympics as a benchmark here and go right back to basics instead. Collins online dictionary defines sport as: “an individual or group activity pursued for exercise or pleasure, often involving the testing of physical capabilities and taking the form of a competitive game.” Formula One definitely fits that category. The dictionary defines entertainment as: “an act, production, etc, that entertains; diversion; amusement.” And actually, Formula One fits in that category too. So whilst the aim of this mini series is not to provide answers, merely to shine a light on the questions, perhaps we have actually solved our first mystery. The answer is that Formula One is both, a sport and an entertainment, and as such it has to constantly tread that fine line between keeping the purists happy and the fickle entertained. And if that is the answer, then this debate is one that will continue to rage for the foreseeable future. 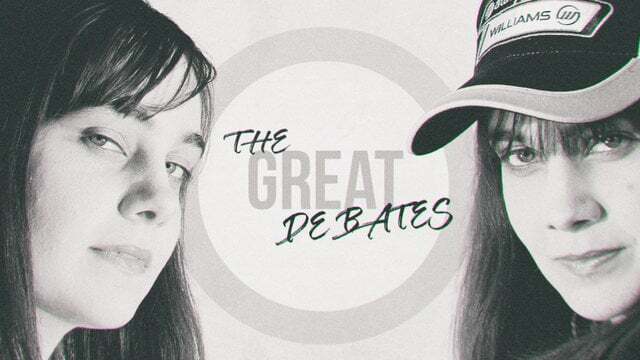 Thank you for listening to this first episode of The Great Debates. What do you think about sport versus entertainment? What other great debates do you feel dominate the sport, or entertainment, of Formula One? Let me know by visiting sidepodcast.com/contact. And join me again tomorrow for the second episode, and our second great debate. See you then! Next post The Great Debates - Which F1 qualifying format is best?